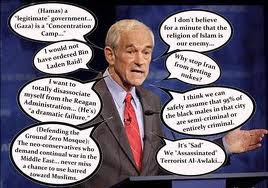 "Rep. Ron Paul, an icon to the libertarian Right and to some on the anti-war Left, gave a farewell address to Congress that expressed his neo-Confederate interpretation of the Constitution and his anti-historical view of the supposedly good old days of laissez-faire capitalism. 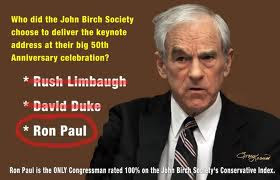 "In a near-hour-long rambling speech on Nov. 14, Paul also revealed himself to be an opponent of 'pure democracy' because government by the people and for the people tends to infringe on the 'liberty' of businessmen who, in Paul’s ideal world, should be allowed to do pretty much whatever they want to the less privileged. "It took the Great Depression and its mass suffering to finally convince most Americans 'that sacrificing some liberty was necessary,' in Paul’s curious phrasing, for them to gain a living wage, a measure of security and a little respect. "So, under President Franklin Roosevelt, laws were changed to shield working Americans from the worst depredations of the super-rich. Labor standards were enacted; unions were protected; regulations were imposed on Wall Street; and the nation’s banks were made more secure to protect the savings of depositors. 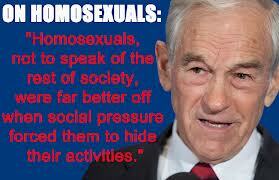 "Many social injustices also were addressed during Ron Paul’s dreaded last century. Women got the vote and their position in the country gradually improved, as it did for blacks and other minorities with the belated enforcement of the equal rights provisions of the 14th Amendment and passage of civil rights legislation. "The reforms from the Progressive Era, the New Deal and the post-World War II era also contributed to a more equitable distribution of the nation’s wealth, making the United States a richer and stronger country. The reforms, initiated by the federal government, essentially created the Great American Middle Class. "But in Paul’s view, the reformers should have left things the way they were – and he blames the reforms for today’s problems, although how exactly they’re connected is not made clear. "But Paul’s blaming 'progressive' reforms of the last century for the nation’s current economic mess lacks any logic, more a rhetorical trick than a rational argument, a sophistry that holds that because one thing happened and then some bad things happened, the first thing must have caused the other things. "The reality is much different. Without Theodore Roosevelt’s Progressive Era and Franklin Roosevelt’s New Deal, the direction of America’s capitalist system was toward disaster, not prosperity. Plus, the only meaningful 'liberty' was that of a small number of oligarchs looting the nation’s wealth. (It would make more sense to blame the current debt problem on the overreach of U.S. imperialism, the rush to “free trade,” the unwise relaxing of economic regulations, and massive tax cuts for the rich.)" "Besides his reactionary fondness for the Gilded Age, Paul also embraces an anti-historical attitude toward the Founding Era. He claimed that the Constitution failed not only because of the 20th Century’s shift toward 'pure democracy' but because of a loss of moral virtue among the populace. "Paul’s historical incoherence extends to what the Framers were doing with the Constitution. He argues that they were seeking 'to limit government' in 1787 when they drafted the Constitution. But that was not their primary intent. The Framers were creating a strong and vibrant central government to replace the weak and ineffective one that existed under the Articles of Confederation. "Of course, by definition, all constitutions set limits on the power of governments. That’s what constitutions do and the U.S. Constitution is no exception. However, if the Framers wanted a weak central government and strong states’ rights, they would not have scrapped the Articles of Confederation, which governed the United States from 1777 to 1787. The Articles made the states 'independent' and 'sovereign' and left the federal government as a supplicant. "In reaction to those changes – federal regulation of the economy and rejection of overt racial discrimination –the modern American Right emerged as a sometimes uneasy coalition between the 'free-marketeers' and the neo-Confederates, sharing a mutual hatred of modern liberalism. 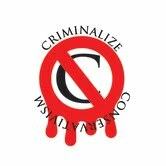 "Those two groups also drew in other constituencies harboring resentments against liberals, such as the Christian Right – angered over Supreme Court prohibitions on compulsory prayers in public schools and abortion rights for women – and war hawks, drawn from the ranks of military contractors and neoconservative ideologues. "These right-wing movements recognized the importance of propaganda and thus – in the 1970s – began investing heavily in an infrastructure of think tanks and ideological media that would develop supportive narratives and disseminate those storylines to the American people. "So, right-wing 'scholars' transformed the purpose of the Constitutional Convention and recreated James Madison in particular. Under the Right’s revisionist history, the Constitution was drafted to constrain the power of the federal government and to ensure the supremacy of states’ rights. A few Madison quotes were cherry-picked from the Federalist Papers and the significance of the Tenth Amendment was exaggerated. "The success of the pseudo-history can’t be overstated. From the Tea Party, which arose in angry determination to 'take back our country' from the first African-American president, to the hip libertarians who turned the quirky Ron Paul into a cult figure, there was a certainty that they were channeling the true vision of the American Founders. 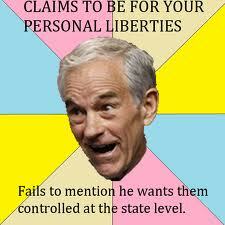 "A large segment of the American Left also embraced Ron Paul because his ideology included a rejection of imperial military adventures and a disdain for government intrusion into personal lives (although he is a devout 'right-to-lifer' who would deny women the right to have an abortion). "However, as his farewell address revealed, his ideology is a jumble of anti-historical claims and emotional appeals. For instance, he posed unserious questions like 'Why can’t Americans decide which type of light bulbs they can buy?' – apparently oblivious to the need for energy conservation and the threat of global warming. 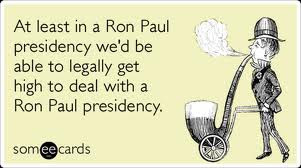 "In the end, Ron Paul comes across as little more than a political crank whose few good ideas are overwhelmed by his neo-Confederate thinking and his sophistry about the inherent value of free-market economics." This is the real Ron Paul, just another Conservative in Libertarians's clothing, the Party, they say, that is made up of nothing more than Conservatives who want to legalize marijuana. Don't be fooled by the Littlest Demagogue - or his son, Rand Paul. They are each hungry for the power that only the White House can provide, hungry for the implementation of their un-American world in accordance with the true principles of the Conservative movement.